Although the simulation data as well as the conclusion on the proportionality between V ip (i) and V g (i) in the work  is correct, interpretation of some data therein should be corrected. As the sampling number (L = 200) to measure the average gene expression level is not large enough, there is a bias in the estimate in V g (i). Finiteness in the number of sampling L will generally cause a bias of the order of V ip (i)/L, in the estimate of the variance V g (i). The too good proportionality between V ip (i) and V g (i) for large σ, shown in Figure two (a)(b) of  (especially for small V g (i)), is due to this artifact. Accordingly, the sharp peak at ∼1/L = 1/200 in Figure three of  is due to this insufficiency by the sample number. Still, the proportionality between the two variances V ip (i) and V g (i), albeit not so sharp, holds, as already observed in the region with larger V g (i) in . We have simulated the model with a larger number of samples, i.e., N = L = 1000. As is shown in Figure 1, the proportionality is well discernible, where the proportion coefficient V g (i)/V ip (i) decreased with the increase in the noise level σ, which was already observed in the broad peak beyond 1/L in Figure three of . This broad peak beyond 1/L in Figure three of  was found to be sharper as N was increased, from 200 to 1000. This peak indeed corresponds to the proportion coefficient extracted from Figure 1 in the present Correction. As the noise level σ was increased, the peak position ρ = V g (i)/V ip (i) decreased. Hence for larger σ, larger L is needed to get reliable estimate in the proportion coefficient. As for Figure five and Figure six of , the sharp proportionality for V g (i) ≲ 0.001 is due to the above bias, while the discussion therein concerns with the approach of V g (i) to V ip (i) at larger V g (i), which is not affected by the bias here. Relationship between V g ( i ) and V ip ( i ). As described in the Method section of , V ip (i) was computed as the variance of the distribution of Sign(x i ) over L runs for an identical genotype, while V g (i) was computed as a variance of the distribution of ( Sign ( x i ) ¯ ) over N individuals, where Sign ( x i ) ¯ was the mean over L runs. Here we adopted N = L = 1000, instead of 200 in . σ = 0.09 (blue *) and 0.03 (red +). The plot of (V g (i) and V ip (i)) for all genes i over 55-65th generations, where we have plotted only those genes with V g (i) > .0002, as the those with smaller than that may have little accuracy in estimating V g (i). To sum up, the main claim of , i.e., proportionality between V ip (i) and V g (i) is valid, but the value of the proportion coefficient ρ = V g (i)/V ip (i) should be corrected. It decreases with the noise level, in contrast to the discussion in  for large σ. Major factor on this proportionality is attributed to the correlation of each variance with the average value Sign ( x ( i ) ) ¯ : In other words, a state with an intermediate expression level (i.e., smaller | Sign ( x ( i ) ) ¯ | ) can be more easily switched on or off, both by noise and also by mutation, and hence the variances generally increase as | Sign ( x ( i ) ) ¯ | approaches 0. 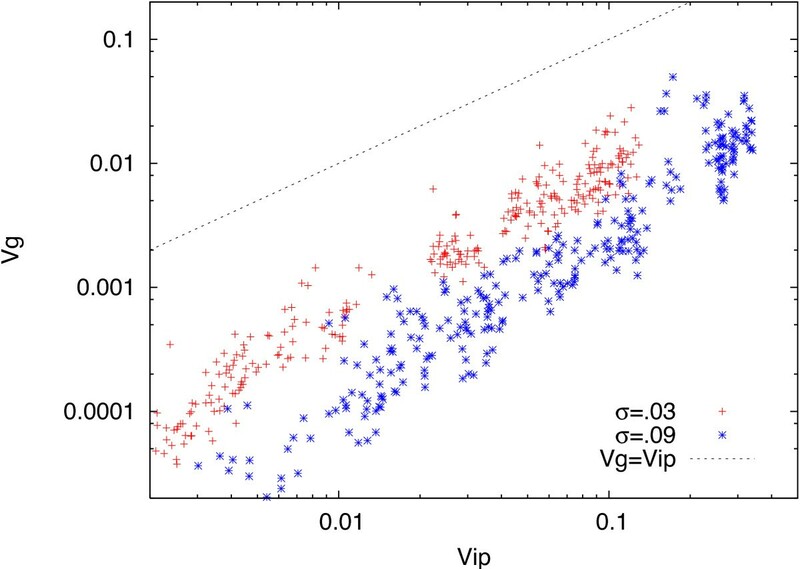 Still, some correlation between V ip (i) and V g (i) remains even after removing this correlation through Sign ( x ( i ) ) ¯ . I regret any inconvenience that misintepretation of the data with an insufficient sample size may have caused.